no free time? need ideas? want it sorted out? no problem! 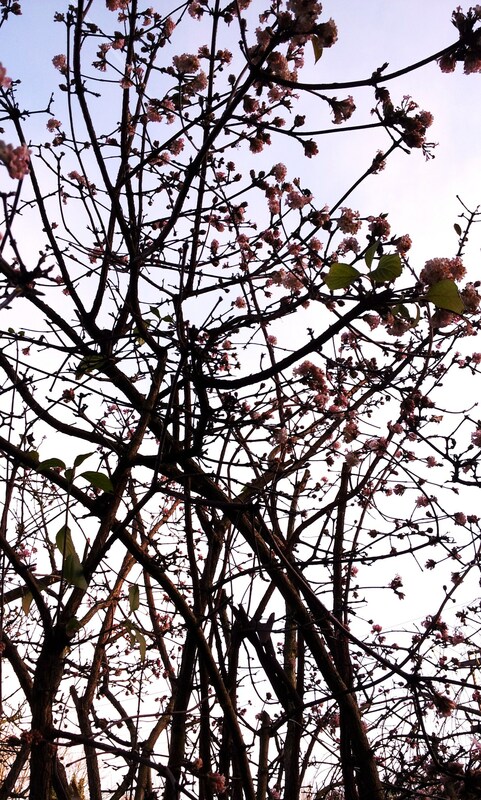 APRIL 2014 – Gardens good for mental and physical health ! So, anyone who is keen on gardening probably thinks this is obvious but it is good to finally have what we always thought supported by research. This recent article outlines some findings from research about the benefits that gardens, gardening, and even just having a few pot plants, may have on increased well-being, recovery from illness and mental health. Click the link below to read more on this interesting story in Horticulture Week. I’ve also posted some photos of my favourite plants below, to cheer everyone up ! NOVEMBER – Create a jazzy winter planter – get creative, cheer yourself up and impress your friends. CREATE A JAZZY WINTER PLANTER – GET CREATIVE, CHEER YOURSELF UP AND IMPRESS YOUR FRIENDS! 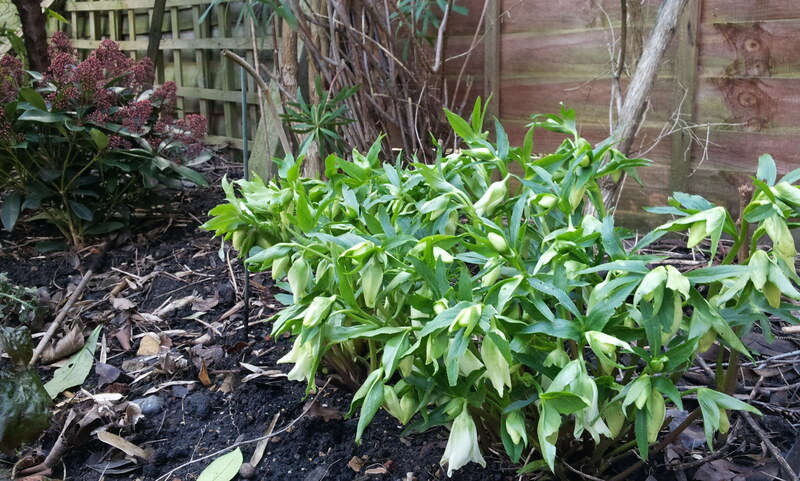 Its been a long, mild autumn but now winter has arrived, even in my quite sheltered London garden. Which got me thinking about easy ways to create a bright and jazzy display without much expense or, if I am honest, effort. I also realise that a lot of you don’t have the luxury of space and might well be limited to a window ledge or doorstep. The answer – a well chosen planter or two, with the right combination of plants. So, here’s my straightforward guide to creating a knock-out winter planter. Personally, I tend to favour a ‘contemporary’ look. It’s just my thing. My general rule – plain is good. Go for something in either a charcoal grey or black (goes with everything, shows off the plants well and always looks tasteful). Those azure blue ones you see everywhere these days are nice too but you do have to be more careful about the colour of the plants you put in them. Polyresin, clayfibre, zinc are all lightweight, robust materials, available in a wide range of shapes, sizes and colours. Cheap terracotta pots and planters are a false economy as they are prone to chipping and cracking especially if they freeze. I also tend to avoid wooden planters as they tend to rot. Regarding size and shape, depends on where you are going to put the planter – if you only have a window sill, measure the length and width in advance, troughs are best. By a front door or on steps, cube planters look great. Make sure the planter has at least one hole in the bottom to avoid getting waterlogged. Bigger is generally better (as long as it will fit and it’s not too heavy) to make a more striking feature, plus you can get creative with plant combinations. 2. BUY A BAG OF COMPOST. Important point – contrast is what you are going for here. Contrast in colour, size, shape, texture. A single plant can look very elegant but what we are aiming for here is something eyecatching. Most plants grow very slowly through the winter, so buy ones that are already the size you want. – Cornus Sibirica or Midwinter Fire (many varieties, these two are particularly bright) / Senecio cineraria Silver Dust / Ophiopogan planiscapus Nigrescens. – Cornus (as above) / Heuchera Silver Scrolls / Carex oshmensis Everillo. – Phormium Bronze Baby (many varieties available but this one has bronze/russet leaves) / Helleborus x hybridus (many varieties and flower colours)/ Vinca Illumination (to trail over the sides of the planter). – Juniperus squamata Loderi (dwarf blue spruce) / Cyclamen coum (a white or deep red flowered variety) / Hedera helix Glacier (trailing over sides of planter). Visit a garden centre and try out others, just group them together, aim for one tall plant and a couple of smaller ones in contrasting colours and forms, use multiple quantities of the smaller plants. To avoid getting compost everywhere, put some newspaper or a bin liner down before starting. It will make tidying up much easier. Put a few handfuls of gravel or small stones in the bottom of the planter to help with drainage. Then fill the planter about half way with your compost. Position the plants in the planter, move them around until you are happy with how they look (general rule, tall plants at the back or in the middle, smaller ones around). Let plants overhang the edges, drape down the outside, whatever you think looks good. Make it look abundant, bursting over the sides. Have a bit of fun and get creative with it ! Fill the planter up with compost around the plants, firm it down well and add more until there is just a 2 cm gap at the top. Give the plants a little water to help them settle in and also clean any bits of compost off the leaves. Finally, put your planter into position, somewhere you will see it easily from indoors so that you can enjoy it from the warmth and comfort of your home all winter. Carex buchananii, Carex oshmensis Everillo, Cornus alba Sibirica, Cornus sanguinea Midwinter fire, Cyclamen coum, Hedera helix Glacier, Helleborus x hybridus Red Lady, Heuchera Fire Alarm, Heuchera Obsidian, Heuchera Silver Scrolls, Juniperus squamata Loderi, Ophiopogan planiscapus Nigrescens, Phormium Bronze Baby, Senecio cineraria Silver Dust, Thuja aurea Nana, Vinca Illumination. 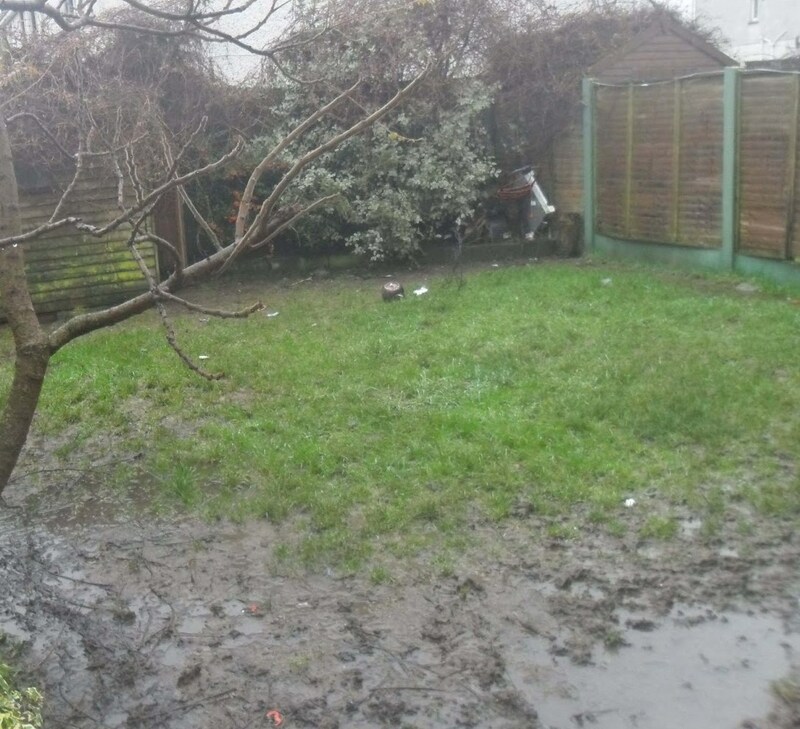 Pretty much EVERY SINGLE garden I work on in London has problems with its ‘lawn’, or more accurately, ‘the patchy area of moss, mud and weeds in the middle of the garden’. Some clients have tried to sort it out but lose heart because nothing seems to work. It never looks like those pictures in the magazines! Lawn care is a big subject, there are entire books and many websites devoted to it, but here are my tips on fixing the main problems and ongoing upkeep. But first: REALITY CHECK !!! A healthy, lush, weed free, moss free lawn requires A LOT OF WORK. If you aren’t going to cut it at least every two weeks from April to November, feed it and weed it regularly (or pay someone else to do it all for you), then let go of your fantasy of having a lovely green lawn like the ones you see in the magazines. Not going to happen. Sorry. Either learn to live with your patchy, mossy area or do something else with the space (such as cover it in gravel, paving, artificial grass or other planting). This is by far the most common problem. London gardens are typically hemmed in by buildings, walls, high fences or hedges on all sides. There are often mature trees nearby as well. These all create shade and we can’t really do much about them. But grass needs a certain amount of light to grow – at least 2-3 hours of sunlight a day even for specially selected shade tolerant grasses. If the space is in deep shade all day long, then grass is not going to grow there and you need to consider alternatives. Reseed/returf the area with a specially selected shade tolerant grass mix. Make sure that you feed the grass at least every Spring and Autumn with lawn fertilizer. Let the grass grow longer in shady areas, do not cut it lower than 6cm/2.5 inches otherwise it will struggle and start to die off. Even so, you may need to partially reseed the area every Spring in order to keep it going. For deep shade, less than 2 hours of sunlight a day, consider alternatives such as an area of gravel, paving, artificial grass or shade tolerant plants (there is a wide choice). This is also very common, soil that is hard as a rock, doesn’t drain well, gets waterlogged when it rains and cracks when it dries out. Typical of London clay soil really. Grass becomes patchy, may die off completely, weeds and moss then invade the area. Get digging. You need to dig up the compacted soil, break up those lumps, mix in a lot of sharp sand and compost. Then reseed/returf. Messing around putting little holes in the soil to aerate it is unlikely to sort it out properly so don’t waste your time. This often happens alongside the problems above. The grass struggles, gets patchy and in come the moss and weeds which may take over completely. Sort out any shade and compacted soil issues first as these are the likely causes of the moss and weeds. Throwing lime and chemicals around might work, for a while, but you probably need to sort out those broader issues first. Rake out moss using a wire grass rake. Dig out weeds and their roots. Use moss and/or weedkiller if you like but be aware that you are still going to have to rake out the dead moss anyway. 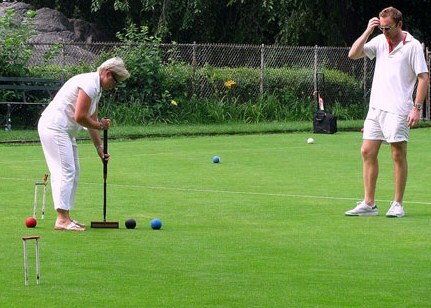 Feed the grass that remains with lawn fertilizer. Reseed in any bare patches. If the area has been completely overtaken by moss and weeds, you might as well dig over the entire area and reseed/returf it, bearing in mind the points above about shade and poor drainage. – Do not cut grass too short, keep it around 5cm/2 inches long as a general rule, but do cut it regularly, at least every two weeks, as this encourages thicker growth. – When you cut your grass you should take no more than 25% of the length off, so don’t leave it for a month then scalp it, as that will weaken the grass and allow moss and weeds to invade. – Feed grass at least twice a year (Spring and Autumn) with a grass fertilizer. – Rake out moss every Spring and Autumn. Dig out individual weeds as you notice them when cutting the grass. – Consider reseeding patchy areas every Spring and Autumn to keep the lawn going. Well, I did say it was a lot of work… fortunately, now you know someone who could do it all for you ! 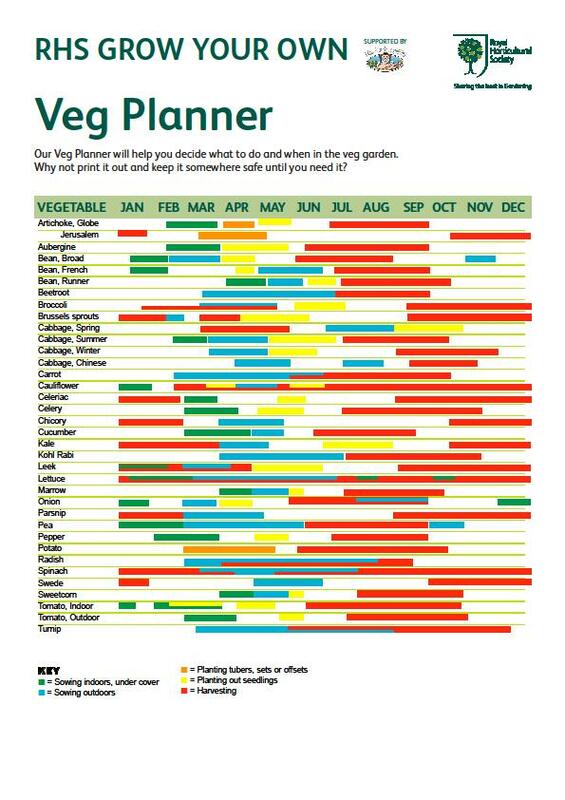 Have you been wondering which vegetables to plant and when? Problem solved. – If you are impatient to get your veg garden going over the next few weeks (and March is the perfect time to start) you can sow Broad Beans, Sprouts, Cabbage, Carrots, Leeks, Lettuce, Onions, Parsnips, Peas, Radishes, Spinach and Turnip in March. Quite a choice! – If you are new to growing your own, start with some easy ones like Broad Beans, Carrots, Lettuce, Peas or Radishes, all of which you can grow in pots, trays or grow-bags if space is limited (just remember to put some sticks in to hold up the Beans or Peas otherwise they flop around uselessly). – Regarding preparation, well I just stick the seeds in, following the directions on the packet about how deep and how far apart. Keep the packets for reference though. And don’t feel like you need to plant them all in one go, they will keep and you can always sow some more in a few months to get a double harvest later in the year. – Pull out some of the young plants once they get going if they are overcrowded as they need a bit of space to grow (refer to the seed packet again on this). Most vegetables prefer a relatively sunny spot however they tend to grow well enough even in semi-shaded places as long as it isn’t in deep shade all day long, they just don’t grow as big or as fast. So don’t let that put you off. – Keep the soil moist. Don’t let it dry out but don’t have it swimming in water either. A good rule of thumb is to water them a little, until the soil is moist, every 3 or 4 days if it doesn’t rain. That’s it really. It’s not anything like as complicated as many people think. Reasons to be cheerful ! After a bit of a break – yes, even I don’t do a whole lot in the garden in January – I decided it was time to have a good look at what’s happening in the garden this month. This is the ideal time to take stock of your garden and see where there are large gaps that could do with a bit of winter interest. It doesn’t take a lot to transform your garden from ‘winter wasteland’ to ‘winter wonderland’. 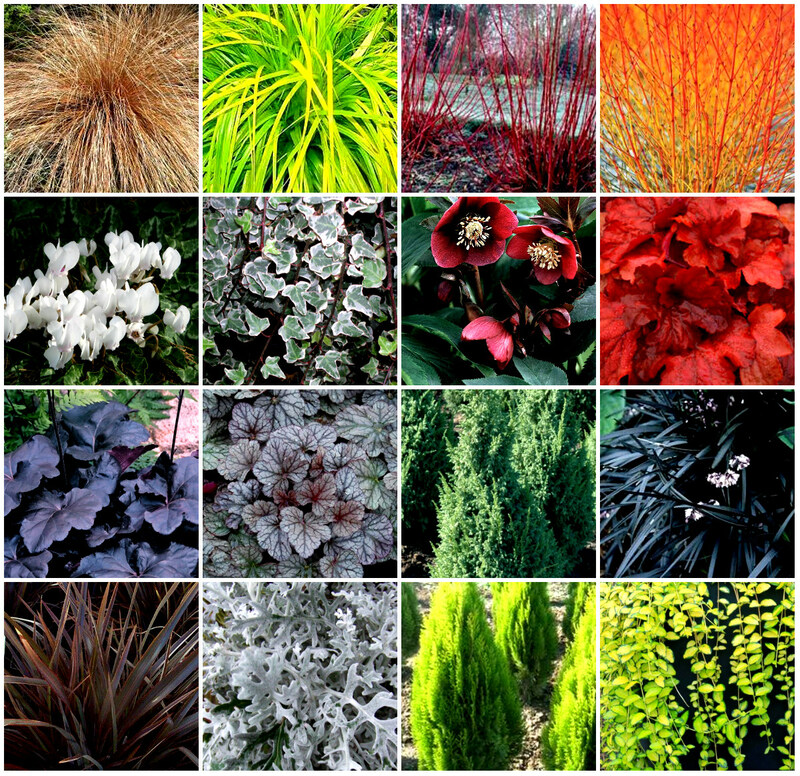 Well, maybe not wonderland but certainly there is a wide choice of plants that will add some much needed colour and interest at this time of year. I was really pleased to see that several of the plants I put in to jazz up the garden are doing well. 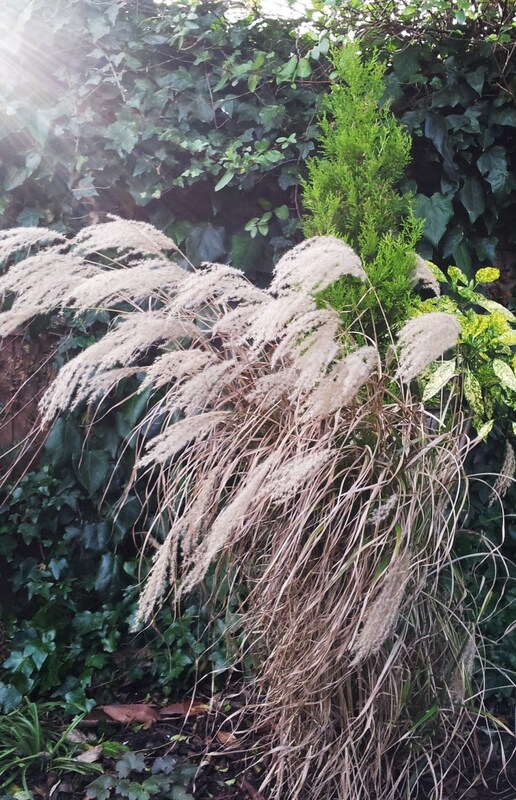 This has definitely inspired me to add some more tall grasses to my borders because they really do look fantastic all year round but particularly now when the pale seedheads are blowing in the wind. Take at look at the pictures and see if you can get inspired to add a few choice plants to your garden. And let me know if you have any special favourites in your own garden that you would recommend (visit my facebook page at http://www.facebook.com/Makethemostofyourgarden if you want to see what other people are suggesting). A very quick tip this month – LEAF FREE LAWN. – then just empty the leaves and grass clippings into your compost bin or garden recycling. Do this a couple of times this autumn and not only will your lawn look a lot better, your garden will look neat and tidy too. If you didnt already give your lawn an autumn feed, its a bit late but you still can, so just spend a few minutes scattering some granular lawn food over it (or see my earlier post about autumn lawn care for more details). By the way, I never bother to pick up leaves that fall on the flower borders. You can if you like but they are good for the soil as they rot down over winter. This months tip – SPRING BULB FEST… right now is the perfect time to plant bulbs for spring. An hour out of your busy schedule this weekend will mean you will be delighted by a dazzling display of flowers in a few months time. Three bits of good news for you – it doesnt take long, you cant mess it up and a huge range of bulbs are on special offer in most garden and diy centres around London right now. So, here’s what you need to do now to enjoy a dazzling display this spring. Its really easy. 1. Pop into your local garden centre or diy shop on the way home from work and buy a LOT of bulbs. Each bulb usually only sends up one flower so if you want to be able to see them from the house you will need at least 50. I recommend planting 100 or more. The more you put in, the better it will look. 2. Which bulbs to buy? Well, snowdrops are the first to flower, usually by the end of January, so definitely get lots of them. Crocuses are next in February and March, so get them too. Then come narcissus and daffodils and finally tulips in April and May. 3. How many and what combination? My recommendation for the maximum effect, get 100 snowdrops, 100 crocuses and as many narcissus, daffodils or tulips as you like. A handy tip when buying bulbs, don’t go for those bags of mixed colours, they are low quality and look rubbish. Instead, pick one colour, it will look much more stylish. White is the best to go for if you want them to really stand out, cant beat it. I only put white ones in my garden for this reason. 4. Where to plant them? You probably want to be able to see them from the house, a spot you can see through the windows. 5. How to plant them? You can dig a little hole for each bulb (and garden centres do sell a special tool to do this) but its a chore and takes forever. What I do is dig a shallow trench about 70cm x 30cm and about 8 cm deep. Thats enough space for 50 bulbs or more. Put the soil to one side. Then just place your bulbs in the hole randomly, with the pointy end sticking up (that’s the end that the flowers come out!). Mix up snowdrops, crocuses, narcissus if you like, that way you will have a succession of flowers over a few months. And put them close together, it will look a lot better. 6. Now just shovel the soil in on top and pat it down. That’s it.If you are feeling energetic, do several patches of bulbs in different spots in your garden, get creative and plant them in arcs, or in pots if you have a balcony or terrace. Just make sure you plant them 8cm deep in the pots.Now just sit back, probably forget you planted them until spring when one morning you will be surprised and delighted to see the first flowers poking up through the soil.